There’s a lot of resistance among many people to what seems blatantly obvious to economists: If housing prices are too high, building more housing will help bring prices down. To economists, it’s a simple matter of supply and demand. If you want to reduce displacement, build more housing. To many non-economists, it seems like a non-sequitur or an impossibility. Building more expensive housing makes housing more expensive. But there’s a new research paper that offers a powerful explanation of why more market rate housing makes other housing more affordable to lower income households. The paper is by Evan Mast, an economist at the Upjohn Institute. The paper exploits a rich, detailed new set of data about households and migration and uses some pretty sophisticated techniques to work out its results, and Mast is after all, an economist, so rather that emphasize the technical findings, let us translate them using to widely known metaphors: musical chairs and Six Degrees of Kevin Bacon. Housing markets explained with musical chairs and Kevin Bacon; no economics required. We all know the old child’s game musical chairs, where children circle a group of chairs (where there’s one less chair than children). The kids constantly move while the music plays. But when the music stops, everyone has to sit down. Whoever doesn’t find a seat and is left standing is removed from the game. Tight housing markets are like that: if they’re aren’t enough houses (chairs) someone ends up on the outside looking in, and in markets it’s not the slowest kid, but the poorest household. The second game is the Hollywood brain teaser of connecting any actor to Kevin Bacon by way of other actors that they worked with in a particular film. So for example, John Turturro’s “bacon number” is 2: he and Julianne Moore were both in the cast of The Big Lebowski, and Moore in turn played opposite Bacon in Crazy Stupid Love. Six Degrees of Kevin Bacon shows that you can connect almost any two people in show business with fewer than six connections, no matter how widely separated they may be in time or genre. Instead of applying this to movie stars, we can connect houses–when someone moves out of one house, it creates a vacancy in another house, and so on, and this chain of moves produces much more widespread change than we might initially anticipate. Our friends at the Sightline Institute have already applied the musical chairs metaphor to housing markets. Chairs are houses, people are like the kids scrambling to find a seat. It doesn’t matter whether you add fancy overstuffed arm-chairs or or simple folding metal chairs to the game, both make it equally likely at the end of the day that there will be a closer match between chairs and hind-ends than otherwise. The second part of our model, which we’ll illustrate with Kevin Bacon’s help, shows how adding chairs or houses produces much wider effects. What’s often hidden from view is the chain of connections from one part of the housing market to another. How does it happen that building more units for high income households (fancy arm-chairs) result in more affordable housing for moderate income households. (Some have argued that metropolitan housing markets are somehow rigidly segmented and that building in one tier can have no effect on other tiers). What our six degrees of Kevin Bacon exercise suggests is that movements into new market rate housing by some people, ripples through the marketplace in a series of consecutive moves–like the connection of one actor to another to another–in ways that ultimately generates change in neighborhoods and housing types far removed from the price tier or neighborhood in which new construction occurs. One hundred new luxury units create about 60 equivalent units in below-median income tracts. The estimates are also large for areas that are even less similar to high- income areas, with about 30-40 equivalent units created in black and below-median income, bottom quintile income, and heavily rent-burdened areas. Additionally, the effect extends outside of the multifamily market—about 50 EUs are created in high single-family home tracts. Note that equivalent unit numbers in different housing types should be considered separately rather than summed together, because an equivalent unit in one type starts a migration chain that may nest an equivalent unit in another. Graphically, Mast shows the successive rounds of new housing being occupied in different neighborhoods. 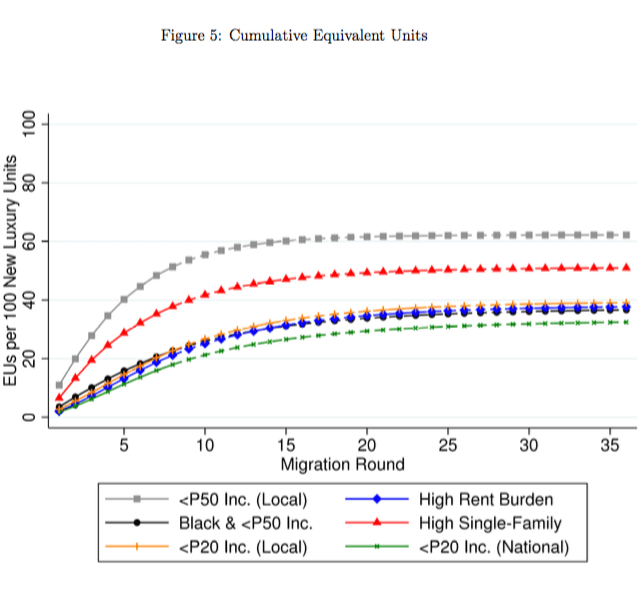 This chart shows how successive rounds of migration lead to additional units opening up in other neighborhoods. Each of the colored lines corresponds to a different neighborhood characteristic. For example, the gray line with square markers shows the fraction of units in neighborhoods with household incomes below the metropolitan median (labeled “<P50 Inc. (Local)”). Initially, nearly all of the newly occupied housing is in the higher income neighobrhoods where new housing units are built (round 1), but in successive rounds, more and more of the newly occupied housing is in lower income neighborhoods, and by round 10, the number of newly occupied units in below median income neighborhoods is equal to nearly 60 percent of the number of new market rate units built in round 1. The rate at which new housing occupancy ripples out to other neighborhoods varies by city, and Mast’s work shows that this is directly affected by vacancy rates. In cities with low vacancy rates, the effects are much more pronounced (the supply effect ripples out further), while in cities with high vacancy rates, the effect is slower and more muted. This makes sense: when there are lots of vacancies, adding new units doesn’t trigger as much migration as when housing markets are tight. What this also means is that the beneficial effects of building new market rate housing will be greatest in just those markets that are experiencing the biggest housing shortages. Building more market rate housing say, in San Francisco, will rapidly ripple through the areas housing stock and free up units in lower income neighobrhoods that would otherwise have been occupied by higher income households. Mast’s findings are roughly comparable to a study undertaken a couple of years ago by U. C. Berkeley’s Karen Chapple and Miriam Zuk. Chapple and Zuk looked at a parallel question, the effect of building market rate and subsidized housing on rates of displacement in California. They found that each two additional market rate units built in a jurisdiction had about the same effect on reducing displacement as building a single unit of affordable housing. Chapple and Zuk’s work confirmed an earlier finding reported by California’s Legislative Analyst Office that building more market rate housing reduced displacement.
. . . the results are also important for evaluating affordability and inclusionary zoning requirements, which require developers to fund a certain number of income-restricted units per market rate unit constructed. My estimates imply that market mechanisms create a larger number of affordable units than such requirements. Moreover, they imply that affordability requirements could lead to a net decrease in the stock of available affordable units under relatively small crowd-out rates. Since each market-rate unit creates 0.6 equivalent units in below-median income areas, lost equivalent units in such areas will outnumber the gain in income-restricted units if each income-restricted unit crowds out more than 1.67 market-rate units. Mast’s study provides some important insights into the mechanisms at work in the housing market. The process by which households move, one after another, from home to home has essentially been hidden from view from lack of data. This paper shines a bright statistical light on that process and definitively disproves the largely uninformed conjectures of supply skeptics and some journalists, that what happens in one part of the housing market in a metro area has no effect elsewhere. Housing markets are highly inter-connected, and building more units at the top end creates a powerful chain-reaction that ultimately adds supply in neighborhoods throughout the region. Note: This post has been revised to correct spelling errors in Dr. Mast’s name; we regret these errors.